Tantalum, element #73 on the periodic table has found its way into dental implants thanks to mega dental implant manufacturer, Zimmer. They have tranferred it from use in hip implants to dental implants. The trabecular metal material structure and stiffness similar to trabecular bone and is fabricated by coating a vitreous carbon skeleton with tantalum through a proprietary chemical vapor deposition coating process. The tantalum exhibits a crystallographic growth on the vitreous carbon surface of the interconnecting struts that form the material. Trabecular metal technology differs from sintered bead surfaces, titanium plasma-sprayed surfaces, titanium fiber mesh and titanium foam in the high degree of its interconnected porosity (up to 80%) and the regularity of its pore size and shape. In contrast to conventional bone-to-implant contact achieved by non-porous surfaces, Trabecular Metal Technology’s geometrical network of interconnected pores is designed for biological ingrowth through the pores. The implant’s coronal, apical and internal implant structures are made of titanium alloy (Ti-6Al-4V grade 5) with a microtextured surface created by grit-blasting with hydroxylapatite.. 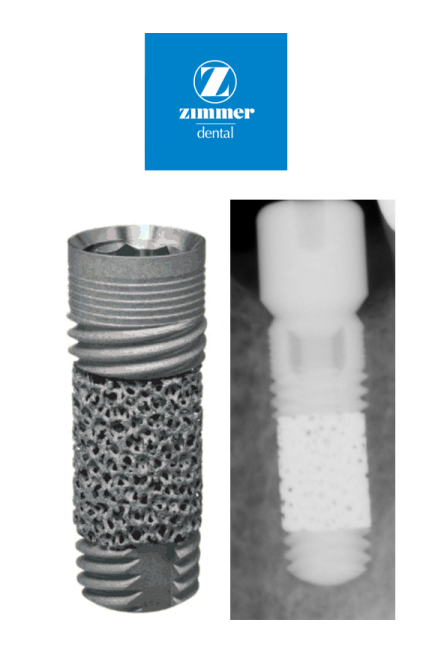 The coronal section features cervical micro-grooves and Zimmer Dental’s internal hex, friction-fit connection, and the apical section features self-tapping threads. In the midsection of the implant, the Trabecular Metal Material is made of tantalum (98%) over a vitreous carbon substrate (2%). Zimmer decribes the implant as having osseoincorporation properties refering to the healing potential of bone onto an implant surface and into an implant structure. The trabecular metal dental implant features an osteoconductive mid-section, formed from the trabecular metal material, designed for ingrowth as well as ongrowth in a process new to implant dentistry—osseoincorporation.